Micro-Times announces the ‘Attic Clear Pro’. The extendable pole that lets you use your iPhone, Smartphone or GoPro to see inside dangerous spaces. SWAT, Police and K9 users wanted something more industrial strength with a longer reach for second story windows and something that would also allow the use of GoPro cameras. The Attic Clear Pro was designed and manufactured in the U.S.A. and incorporates a ¾ inch shaft that elevates the iPhone to approximately 20 feet when held by a 6 foot tall person. The new Pro version has dual flashlight holders, removable extension poles, a redesigned Patent Pending Universal mounting Rack, iPhones can be mounted with or without their protective cases and comes packaged in a 34x10” black padded gun case. Micro-Times includes software, via download, to enable the iPhone mounted on the Attic Clear® to act as a camera and an iPhone or iPad as a monitor. The software automatically sends the video to the monitoring device via the built in Bluetooth. A dedicated Pole Camera can cost upwards to $2,000. The Attic Clear Pro Kit’s introductory price is $399 and allows you to leverage your investment in iPhones, smartphones, cameras, flashlights and laser pointing devices. Micro-Times LLC announces a New Upgrade to the existing Attic-Clear.com product line. The new version of the Attic Clear Pro Kit will be shipping July 2013. The new version of the Attic Clear® (Patent Pending) will come as a complete kit and is longer than the original product. It has a heavy duty telescopic pole, can accept 2 foot extensions and comes in a padded carry case (the new ‘Attic Clear® Pro’ Kit will have an MSRP of $429). The original $259 Attic-Clear is available and currently built on a ‘camera industry’ telescopic pole that is of lighter duty than the new Attic Clear® Pro product. 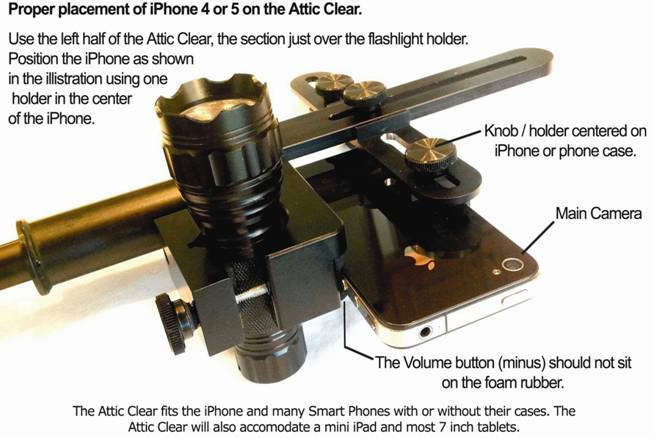 Both the current and the new ‘Attic Clear® Pro’ use the same iPhone / Smart Phone mounting rack (Patent Pending) as seen below in the iPhone Mounting Instructions. If using iPhones, we have software that will allow one iPhone to go up into the attic as shown above on the universal rack and then by turning on Bluetooth, the video will ‘automatically’ appear on the second iPhone or iPad for viewing. No phone line or WiFi required! The Universal Attic Clear Pro will also accommodate two GoPro Cameras and two flashlights, one camera can be pointing forward the other backwards. Detailed Specification Sheet available shortly.